When it comes time every Sunday to put together a meal plan and kitchen strategy for the week, I’m always looking to combine meals and tasks to get the most bang for my buck…and my tick-tock. Making One Dish Dinners is certainly an easy way to make the most of your time in the kitchen. As I test recipes for my One Dish Dinners cookbook and as I fiddle with ingredients and one dish cooking methods, I have found that the time that it takes to assemble the recipes and get them going in the slow cooker or baking in the oven or sauteing in the skillet is often less than 10 minutes…sometimes even less than 5 minutes! One of the reasons that it takes me so little time to assemble some of these recipes is because I already have some of the leg work done ahead of time…chopping onions, batch grilling chicken, doubling or tripling a red or white sauce…then it just becomes a matter of dump and cook! 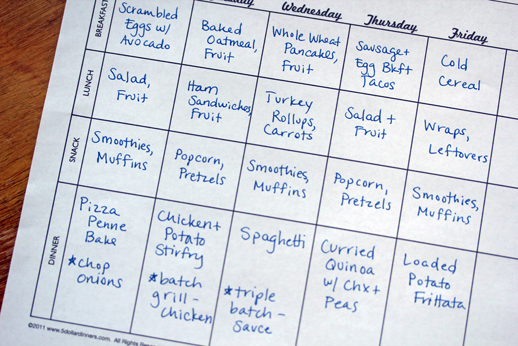 Let’s take a look at the meal plan above and you’ll get a sense for what I’m talking about. On Monday night, I’ll chop up some onions while the Pizza Penne Bake is cooking (and I might even throw some into that meal too.) Then I’ve got them for later in the week for breakfast tacos, Curried Quinoa with Chicken and Peas, and whatever I don’t use I can toss in the freezer to use in a soup or stirfry later in the month. On Tuesday night, I’m going to batch grill a few extra packages of chicken breasts with the Chicken and Potato Stirfry is on the grill. Then I can use the grilled chicken for the Curried Quinoa recipe, or tossed onto a salad at lunch. And just like the onions, whatever is not used can be frozen for later use. And on Wednesday night when I’m making my favorite spaghetti sauce, I might as well triple the batch of sauce so I don’t have to make that on another night when I need a quick “no brainer” meal! Are you starting to see the method to my madness?! Being able to spend less time in the kitchen will allow you to spend more time with your family doing the things you love to do! 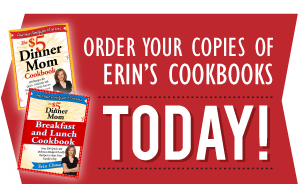 The meal planner pictured above, and other printable planners, are available for free on the $5 Dinners Printable Planners page. What are some ways that you stretch your bucks and your minutes in the kitchen?! This entry was posted in How To, Tips and Tricks. Bookmark the permalink. The other day I cooked 3 clearanced chickens in my roaster. While they cooked I chopped the veggies. When they were done, I immediately started on gravy, picking the meat and bagging for several meals, then made broth. I have a dehydrator, so when I see a great deal on produce, I can really take advantage of it. I found a great deal on onions a few weeks ago and dried them and they’re in my pantry for use in soups and casseroles. My dehydrator saves me tons of time and money in the kitchen:) Thanks for your site! Meal planning has saved me TONS of time. I plan for the whole month. I don’t always totally follow it exactly, but at least I have the meals planned out to refer to. I menu plan and one day a week I cook “ahead”, and make 2 or 3 extra meals and put them in the freezer for busy nights later in the week. Pyrex makes great casserole dishes that have plastic lids for storage in the fridge or freezer. I also chop up veggies as soon as wel bring them home to save time when it comes to dinner prep. I love to throw some chicken or a cheap cut of beef in the crock pot with a packet of onion soup mix and a can of cream of mushroom soup. Then, when the meat is done, I can add rice and veggies right to the cooker and have a cheap, quick, one pot meal. I buy my onion soup and my cream soups at Dollar General or Dollar Tree because they are so much cheaper there. If you’re stuck in a dinnertime rut and are battling runaway grocery bills, The Organized Cook will do the planning and organization for you to prepare healthy, delicious meals for your family while saving you lots of time and money; visit me at http://www.OrganizedCook.com. Great ideas but I cannot believe that Kim Daniels would use your site to promote SELLING her own plan while you give them away. Shame on you Ms Daniels!